Have you ever thought about this strange concept called time? You’d like to think a second is a second, an hour is an hour, and one day is one day. But that’s not how it feels, right? Remember when as a kid, there were days you were bored? Time seemed to slow down—as if boredom was stretching each minute. An hour felt like a never-ending amount of time. Scientists may tell us that one minute is one minute, and it’s exactly 60 seconds, or 60,000 milliseconds. Sometimes time slows down. Sometimes it speeds up. The reader’s experience is not just about the time line in your story—whether your story describes an hour, one day, or three decades. It’s about how fast or slow the time seems to pass. It’s subjective. A fast-paced story keeps readers on the edge of their seats, eager to know what’s happening. There’s a lot of action. The storytelling is vivid and dramatic. In contrast, a slow-paced story is more atmospheric. An author takes ample time to describe the scenery. Scenery descriptions can be beautiful and engaging, but if the description isn’t compelling or the sentences jar, readers start yawning. The example below comes from the book “Personal” by Lee Child. Child heightens the drama of the story by taking a whole paragraph to describe a few seconds. The “she” in this story is Casey Nice, a partner of Jack Reacher, and together they’re trying to access critical information on a laptop. This is a matter of life and death. But first they need to get two passwords right. Can they do it with the hints they’ve received? She held down a button and the screen lit up with a dialog box. She dabbed it with a fingertip and a cursor started blinking on the line, and a picture of a keyboard came up below it. She typed Archibald, nine letters, with a capital A and the rest in lower case. She checked it for spelling, A-r-c-h-i-b-a-l-d, and then she looked at me with eyebrows raised, and I nodded a confirmation, and she touched Submit, and there was a pause, and then a green check mark appeared at the end of the typed name, and the dialog box rolled away, and was replaced by a second box that looked just the same. She dabbed a button that changed the keyboard letters to numbers, and she typed three digits, and a hyphen, and two more digits, and another hyphen, and then four more digits. She checked it over, and touched Submit, and the green check mark showed again, and the dialog box rolled away, and was replaced by ranks of thumbnail images. Child heightens the tension by describing every tiny detail of what’s happening. The time slows down, but the drama increases. The scene is full of action: She held down a button, she dabbed at it, the cursor started blinking, she typed, she checked, she raised her eyebrows, I nodded, she touched, the check mark appeared. Then they left, and as before we carried the computer up to Nice’s room, and we entered the private information, and the screen opened up with a long list of files and folders. In this scene, Child doesn’t give us much detail. In half a sentence, he explains they’ve entered the passwords, and there’s no drama at all. The first scene of password entering was dramatic. But writing a second scene like that would be boring. So, Child speeds up the time. Good storytelling slows down at dramatic moments, then skips through boring events. JT had just gotten married and he and his wife set out to buy their first piece of furniture together–a new mattress. The search began at local mattress showrooms; vast fields of mattresses neatly laid out under the buzz of fluorescent lights. Pushy salesmen pushed them to buy a fully loaded, feature-rich memory foam mattress. For $3,300 it should have been the pinnacle of comfort, but it wasn’t. To make matters worse, the return policy rendered it impossible to return. It was like car shopping. Actually it was worse than car shopping. At work the next day, he shared his story with Daehee. The two friends from college had been working together at a company in Palo Alto, and unsurprisingly had similar experiences. There was work to be done. When telling the story of our business, we’re tempted to share all details. We want to tell the whole story. Readers don’t need to know everything to follow your story. Give them the details that matter, and let them imagine the rest. This story is completely different from Tuft and Needle’s founding story. It feels slower, because there’s little action. The time line, however, is much longer. In just a few lines, the story summarizes three decades—how 10% of the town’s people work at the jeans factory, and then one day, the factory closes down. The story shows how Hiut uses the town’s best talents to manufacture denim, and they don’t need much action to explain that. The best storytellers think about their audience and how their story transforms them. Their story has a purpose. The action, the details, the pacing all serve that purpose. So, think about your reader: Why would he care about your story? What do you want him to feel while reading? What do you want him to remember of your words? I’m a fan of Lee Child and the Jack Reacher series. I’ve read the book, Personal, along with plenty more! It’s a great example you’ve highlighted from the text. Especially, how the second episode is shorter. I need to work on weaving in more storytelling. I had been on the hunt for a good example of pace in storytelling and when I read that first scene, I thought, “this might be a good one.” When I then read the second scene, I loved it for the contrast. So, then I decided to finally write this post. Thank you for stopping by again, David. I appreciate it. Have you tried David Baldacci or Peter May? They are two of my favourite thriller writers. Yes, I like Baldacci, too. I haven’t read Peter May, so I’ll add him to my list. Thank you! I appreciate the tip. Another thoughtful post. I think your illustrations of a slow-paced and fast-paced story sum up everything you said in words, just as brilliantly. I also think we used to be better at accepting slower paced stories before the tsunami of the internet; but now we’re just impatient to get to the point. We’ve forgotten how to stop and smell the roses. Having said that, great story telling has never, nor should it ever, go out of style. I agree with you, Mel. The internet doesn’t help us appreciate slower paced stories. I’m trying to re-learn to “stop and smell the roses” and to detach myself from social media, email and other distractions. It’s amazing how difficult that actually is. Thank you for stopping by again, Mel! And I’m glad you like the teddy bear. Thank you for this valuable refresher lesson on storytelling and for consistently sharing such helpful articles, Henneke! Thank you, Meaghan. I’m glad you found it valuable! And I love the Teddy bear! Storytelling is something I want to learn. I usually buy books on personal development and entrepreneurship, but a few months back I bought a handful of storybooks just to hone in on storytelling. One of the best ways of learning storytelling is vlogging. I’ve learned that it’s no easy game because if your story isn’t interested; people are going to switch to another video. So one has to make vlog title, thumbnail, video footage, talk, music align to the story. I learned so much about storytelling by making vlogs on YouTube. That sounds like a brilliant way to learn how to tell well-paced stories! Thank you for sharing, Hassaan. I love your teddy bear! Hi Henneke, love your info about writing, not impressed by the and and and story of a well known writer. Finally published my first book and will read all the articles you supplied. Amazing how our paths keep crossing. Thanks so much for the mail. Congratulations on publishing your first book! PS I’m not surprised you don’t like Lee Child’s writing. I don’t think it’s your type of book! It’s very nice and it’s very useful to me. Thanks a lot. I’m glad you like this post, Vinod. I couldn’t think of any other cartoon concept to set the tone for this post. Tuck me in, tell me a story, and if it’s done right, I might buy what you’re selling or read your copy again! Genius. 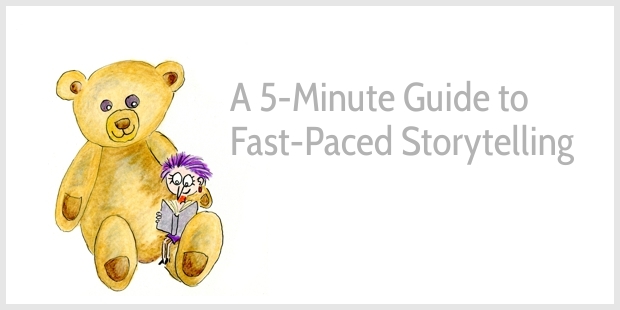 Defining fast and slow pace along with the perfect, poignant examples helps to filter out all of the story details that will create speed bumps for the reader. If your story involves a lot of struggle over a long period of time, you might be inclined to detail some of the struggles. I’m glad you like the cartoon, Yvonne! Happy writing! And thank you for stopping by. I appreciate it. If you want to read some amazing stories go to The Wizard of Ads – Roy H Williams and feast your eyes on the stuff he writes. He includes music, video selections, spectacular images and delivers it all weekly, rabbit hole to god only knows where, in his free Monday Morning Memo. He recently wrote this incredible story about a road trip with his son – in which he told the meaning of business…. Your book is meaningful and neat to read and understand. It’s very encouragement to me. Really enjoyed this brief guide! Storytelling is something I’d like to include more in my business, but I always trip up and add too much detail. Though, the way you describe it and how to cut it down for time sake makes it easier to digest. Thanks again! I think most of us are inclined to use too many details. When I edit a story, I try to be extra strict with myself to delete as much as possible. It can also help to set yourself a target (e.g., scrap 25% of your total word count). I am not good at story telling but expert in story writing. 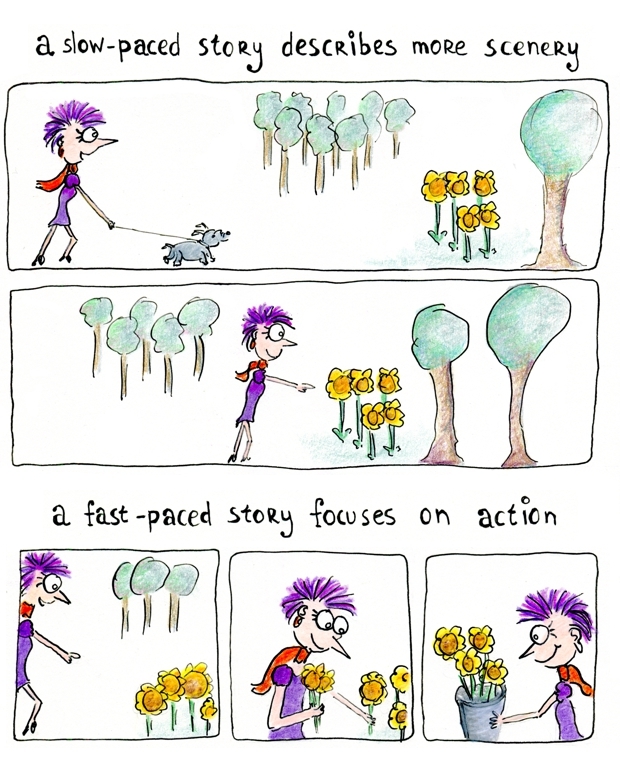 I always love to read slow going stories i don’t want to know anything in the beginning. I love long and deep stories and thriller stories by Peter May. I just discovered Peter May, too! Thank you for stopping by, Abdullah. Happy story writing! When I started reading and digesting your blog post, It feels like an abstract connotation. Your explanation on the concept of time is so inspiring. Your analysis with storytelling with the effect of timing is commendable. Hi John — I’m glad you enjoyed this. You did a SPECTACULAR job of explaining pacing! One of the goals that I am working towards currently is to be an author, and a big problem I have is figuring out how to put words together to get through a slow scene. For example, a town scene. I would be pretty comfortable if it was an action scene, where everything was fast-paced. I could describe the character racing through the streets, his boots rapidly striking the cement, the vendors and villagers a blur in his peripheral, and the looming castle walls in the distance rapidly drawing closer. Your analysis of the author Lee Child’s book is really helpful though, and now I can sort of see how experienced writers vary the pacing of their writing to keep everything flowing so that their readers are eagerly (and excitedly) flipping to the next page. This bit is also awesome and I can definitely relate to wanting to share all the details whenever I am writing something, even if it is just a bio, a summary or introduction. And when I’m writing, most of the time I’m aware that I’m adding in information that might not even be necessary or even relevant. Getting a better grip on what I want to communicate, and resisting the urge to add in fluff just ‘cuz it sounds good, will be something that I’m going to work on!